Football fans who say they thought they were buying a share in a “real life club” are demanding their money back from an app firm. Thousands signed up to OWNAFC after its director said it would enable them to make decisions over the running of a club it took over. Customers said they thought paying £49 would mean they had a share in a club and be entitled to help run it. But OWNAFC denies wrongdoing and said the £49 was to access the app. It said shares would only be on offer once a club was bought. Gunnercooke LLP, legal adviser to OWNAFC, said it accepted the business needed to be more open with customers. Hednesford Town FC had considered a takeover by the app but a “collective decision” was made to not go ahead. One customer, who wished to be known as Nicholas, said: “I paid the money on behalf of my 13-year-old son because it seemed really exciting. “But after I paid… we received an email about FAQs and in there it said I hadn’t paid for a share, but that we would be ‘entitled’ to a share. In a statement issued on behalf of OWNAFC founder and director Stuart Harvey, Gunnercooke LLP said: “In no way has the business done any wrongdoing and we strongly reject any accusations of fraud. A spokesman said those who paid £49 unlocked features of the app “allowing them to engage in the experience of running a real football club, by making all boardroom decisions upon deal completion and takeover”. A non-executive advisory board is being appointed and, as part of this move, Mr Harvey will be stepping aside from the business, added Gunnercooke LLP. Mr Harvey said he had closed down the company’s social media pages due to online abuse and threats to his family. The company brochure stated that “All OWNAs will have the option of buying one share within the club at the nominal value”. It also said that the choice of club to take over would be “the first decision that you and your fellow OWNAs will make”. But customers said they were still unclear as to what their £49 bought them. 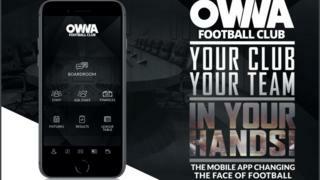 The company’s website also said “by making payment of £49, you are securing your position as football club OWNA and unlocking all features of the OWNAFC app”. It also said “once the club purchase is complete, you will unlock the app features and really put your theories into practice”. Meanwhile, customers have been applying for refunds through their bank. Watchdog Action Fraud confirmed it had received reports relating to OWNAFC within the past two weeks and, as part of its process, informs the National Fraud Intelligence bureau, which then contacts the relevant police force. Greater Manchester Police, the force in which the business is registered, said it had not yet received any reports. One of the clauses in the website’s terms section states that refunds are only offered “if a takeover is not completed within three months of a club accepting our offer”. “If no offer is made to a football club by 01/06/2019 then refunds will be offered”, it says.